Once your Doteasy hosting account has been set up, our system will send you an email containing your Doteasy account details as well as the necessary DNS changes you need to make to point your domain to your new Doteasy servers. Unfortunately, DNS changes can take up to 48 hours to propagate, during which there is no control over which server (your old host or your new Doteasy server) your website will load from. To minimize website downtime, we recommend that you migrate your website to your Doteasy account before you make the DNS changes. This allows you to have a copy of your website on both your old host as well as your new Doteasy server during the DNS propagation. Before your DNS settings are changed to point to your Doteasy servers, your domain name will still be pointing to your old host. This means you will not be able to connect to your Doteasy server using your domain name, such as ftp.yourdomain.com. Instead, you will need to connect to your Doteasy using the server IP address. Click on View FTP Info. You will find your server IP address under FTP Info. 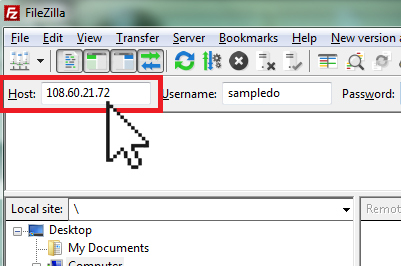 Open your FTP client and enter the IP address in the Host field. Enter your Doteasy Member ID and password into the Username and Password fields to connect to your Doteasy server. If you current website is made up of mainly HTML files, then you can easily transfer your website to Doteasy using FTP. Make sure you download all of your web files from your current host. Open your FTP client and connect to your current web host. Download all your web files from your host’s server to your local computer. When done, simply disconnect to close that FTP session. Establish a new FTP session by connecting to your Doteasy server. You will find your FTP login username and password in your Doteasy Member Zone. Remember, if you are transferring your web files prior to making DNS changes, you will need to use the server IP address instead of ftp.yourdomain.com. Upload your web files from your computer to your Doteasy server. Your Doteasy web hosting account comes with the phpMyAdmin interface, where you can import your existing database. However, you will first need to export your database from your current host as well as create a database on your Doteasy account. 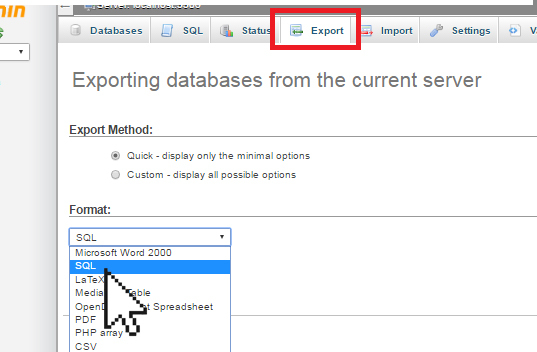 Once done, you can then import your .sql file to your new Doteasy database. Login to your Doteasy Member Zone and click Access Site Admin Panel (cPanel). On your Doteasy account cPanel interface, click MySQL Databases under the Database section. Create a new user and add the user to the database. If your current host provides the phpMyAdmin interface, you simply need to login to your phpMyAdmin and use the Export function to export your database in the .sql format. 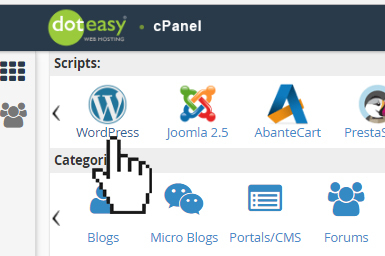 On your Doteasy account cPanel interface, click phpMyAdmin. Click Choose File to select your .sql file. Click Go to begin the import process. 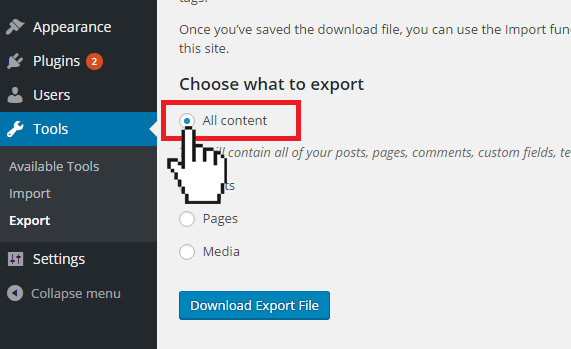 If you are moving your WordPress website from your current host to Doteasy, you can easily do so using the WordPress Import/Export function. Before you begin, please make sure you back up your Wordpress directory, images, plug-ins and other files. Login to your current WordPress dashboard and click Tools. Select Export and select All content. Click Download Export File to begin the download. Before you can import your existing WordPress website, you will need to install WordPress on your Doteasy hosting account. Login to your Doteasy Member Zone and click Access Site Admin Pane (cPanel). Click WordPress under Doteasy Softaculous Apps Installer. Click Install Now and follow the instructions on the screen to install WordPress on your Doteasy account. 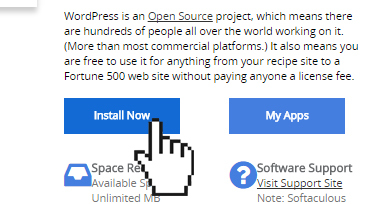 You can import your WordPress once installation has been completed. However, if you are setting up your WordPress website on your Doteasy account prior to making DNS changes, you will need to connect to your WordPress dashboard using the server IP address instead of your domain name (please refer to the first section of this article about finding the server IP address). Once you have your server IP, you will need to edit your host file on your computer. Changing the host file on your computer enables your computer to override the DNS for a domain name. By editing your host file, you are basically telling your computer to access the specified IP address you have entered when visiting the specified domain name. Editing the host file involves adding three entries. Each entry contains the server IP you want the domain name to resolve. These 3 entries mean the following: sampledomain.net, www.sampledomain.net, and [anyname.sampledomain.net] all resolve to 108.60.21.72. Press the "Windows" key on your keyboard. Enter "Notepad" in the search field. In the search results, right-click "Notepad" and select "Run as administrator". Enter the server IP and domain name you have. On your computer, select "Applications - > Utilities - > Terminal. You will then be asked to enter your password. Type in your password and hit “Enter” on your keyboard. You can then enter your server IP and domain name. Save your changes by pressing Control and X at the same time. You will be asked if you really want save your changes. Enter “Y” to proceed. You may close the Terminal window now. Once you have edited your host files, you can continue importing your WordPress website onto your Doteasy account. Login to the WordPress dashboard on your Doteasy account. Select Import and select WordPress. Follow the instructions provided on screen to begin the import process. If your old host uses cPanel, we can help you transfer your entire website (files and databases) as well as emails for you. Simply contact us with your request along with the login information to your cPanel dashboard with your old host.